Finally, there’s a software licensing solution that creates higher software license compliance and better revenue recovery without brand damaging audits or outdated license managers. This leading provider of EDA and semiconductor IP helps engineers design the transistors, standard cells, and IP blocks that make up systems on chips (SoC). Its digital tools automate the design and verification of gigascale, gigahertz SoCs at the latest semiconductor processing nodes. Its IC packaging and printed circuit board (PCB) tools permit the design of complete boards and subsystems. 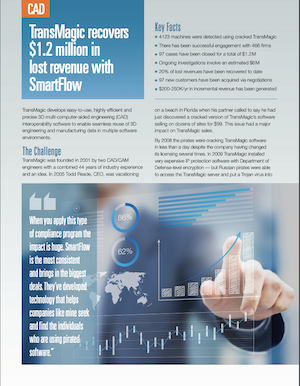 When the company got serious with a formal compliance organization, it chose SmartFlow. This leading EDA software developer is focused on helping customers build great products that connect the world. When it discovered its software was being pirated, it began looking for solutions to stop the piracy. The company had suspected for a long time that its software was being pirated so four years ago a pilot program was started in which anti-piracy technology was integrated into one of the smaller software product lines. The technology validated the assumption that piracy was very pervasive in terms of the volume of software licenses being stolen. This pilot program also provided clear proof that other product lines were being pirated as well. TransMagic develops easy-to-use, highly efficient and precise 3D multi-computer-aided engineering (CAD) interoperability software to enable seamless reuse of 3D engineering and manufacturing data in multiple software environments. In 2005 the CEO discovered a cracked version of TransMagic’s software selling on dozens of sites for $99. This issue had a major impact on TransMagic sales. By 2008 the pirates were cracking TransMagic software in less than a day despite the company having changed its licensing several times. The SmartFlow solution is a win/win for TransMagic because it not only recovers lost revenue from pirated software, but also provides the company with new customers as an alternative to a punitive approach. This architectural engineering company is transforming the way the world works by delivering products and services that connect the physical and digital worlds. Core technologies in positioning, modeling, connectivity and data analytics enable customers to improve productivity, quality, safety and sustainability. When the company’s director discovered its software was being pirated, he began looking for solutions to stop the piracy. SmartFlow has complemented and upgraded the company's anti-piracy program immensely. The financial recovery is growing, which the director appreciates since piracy is also growing. Another positive impact is that legal customers are very happy that the company is pursuing the pirates who are robbing the industry and creating an unfair competitive advantage.